The wooden cart rocked slowly over the cobblestones down from the chapel in Our Lady of the Snows Convent and out between the fishermen's cottages before making its way towards a dusty plain to the east of Puerto de la Cruz. Two men, guarded by four members of the Provincial Guard, were seated at the rear together with the bailiff, a judicial clerk and two priests. The prisoners' hands were shackled behind their backs and their foreheads dripped beads of dirty sweat. 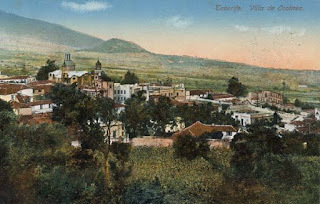 It was 2nd June, 1881 and a typically humid morning in the Orotava valley, with that familiar low cloud hanging against the sloping hills. But their sweat was caused, not by the sticky warmth of early summer but by sheer terror. The Supreme Court had sentenced them to die by the dreaded garrote vil. Shortly afterwards almost the entire population of Puerto de la Cruz, summoned to witness the execution as an example, held its breath. They watched as Manuel Brito and Pedro Armas were seated and tied, almost with compassion, to the two wooden posts which had been erected specially for them the previous evening. To begin with the silence was broken only by the sea punishing the nearby rocks just beyond the flat piece of land which separated the town from San Carlos cemetery and the San Felipe fortress. The officiating priest was thankfully brief. The authorities also stood in respectful silence. But there was horror in their eyes as the executioner, who had been brought out from Seville specially for the occasion, began to turn the wooden handles of the garrote at the back of the condemned men’s necks one by one and their imploring cries drowned the waves on the rocks. The fearful screams were the consequence of their crime. Their gradually reddening faces and desperate choking gasps was their cruel penalty. As the screws twisted behind the wooden posts the ropes pulled on the metal bands, tightenening gradually and with torturous agony around the men’s necks until they suffocated. Theirs was the last public execution in the Canary Islands and historians remember it as a horrible event. 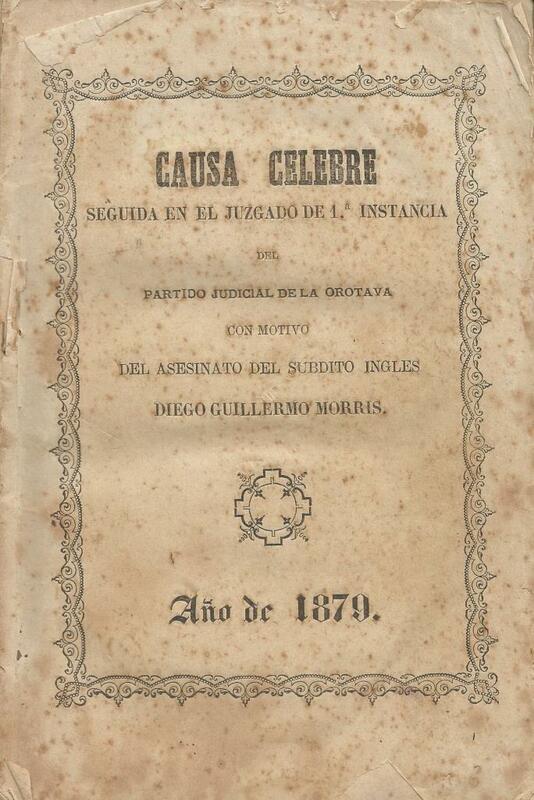 They had been accused of murdering James William Crighton Morris, a British resident who had arrived in Puerto de la Cruz in 1873. He was only 24 and had been sent to Puerto a year after joining his uncle Thomas Miller's firm in Grand Canary to be a part of the Miller's subsidiary in Tenerife, known as Miller and Son. 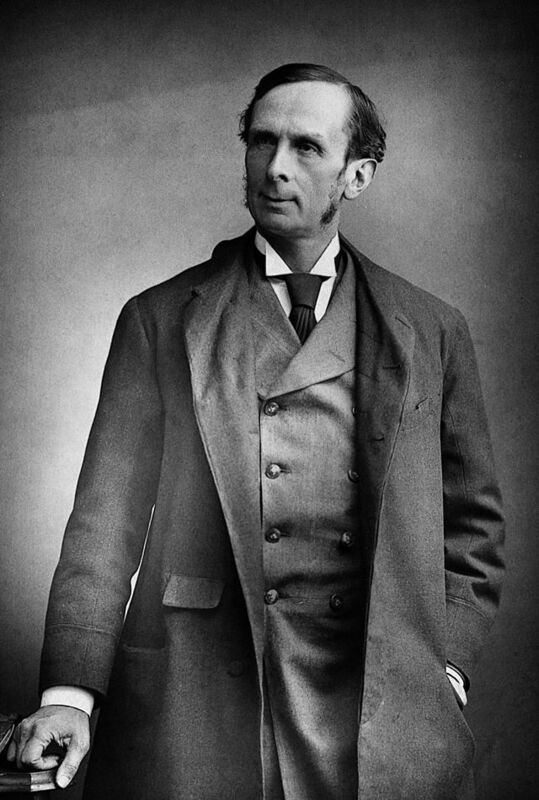 Peter Spence Reid managed the firm in Puerto de la Cruz but later broke away from Thomas Miller to found his own enterprise which became known as Thomas Miller Reid and Company. Young Morris was chief cashier. That may well have been his downfall. He is thought to have been a bit of a loner and historians suggest he had a weakness for women and possibly for wine. He also hung keys from his pocket watch chain. They were the keys to the company offices and safe. Manuel Brito and Pedro Armas each had ambitions. Brito was 36. He was married with two children but apparently had a lover in Santa Cruz with whom he wanted to disappear to South America. His friend, 44 year old Armas also had a family but just hungered for money. They worked out a plot to rob James Morris of the company takings. Having studied the foreigner's liking for women and wine, they persuaded him that a local girl was interested in meeting him close to the San Felipe fortress. The murder took place was on Sunday, 25th November, 1878. It was an overcast, dark and chilly evening. The younger of the two local men dressed up as a woman and hid while Armas led the victim to the chosen rendezvous. When Morris was close enough Brito threw a handful of clay into his eyes before they both beat him up and stabbed him several times. They took whatever possessions he carried on him, his gold pocket watch, a gold locket, a small revolver and the safe keys which dangled enticingly from his watch chain. Brito and Armas had a risky plan worked out. First they returned in the dark to Peter Reid's offices in what was then known as Calle del Sol where they removed the contents from the safe. In total they stole over 20,000 Reals, the silver and copper coins of the period which they shared out and hid. To this day the coins have not been recovered. Getting rid of the body was only their second priority. This they did in the early hours of the following morning when in those days nobody would be about. They carried the unfortunate Morris to the nearby San Carlos cemetery and placed his body in an existing tomb belonging to an aristocratic lady, the Marchioness of San Andrés and Viscountess of Buen Paso who died in 1853. In their haste to replace her tombstone, it cracked. That was to be their undoing. When company employees opened up the offices on the following Tuesday morning nobody suspected James Morris of going off with the cash even when he failed to turn up to work as punctually as always. Although they had apparently locked the safe again after removing the money, the thieves, in their eagerness to find more money, had left the offices in considerable disarray, with documents and other items strewn all over the wooden floor. On the contrary, whilst investigations were kept very discrete, there was immediately grave concern for the fate of young Mr James Morris. Three days after the crime there was a funeral for a child who had died of pneumonia. The burial ceremony at the cemetery was delayed because the gravedigger refused to do his job until the required official permit had been issued by the municipal judge. Mourners were forced to stand around waiting for the document to arrive. As fate would have it a local blind man, Juan García Olivera, sensed something strange in the air. He told the gravedigger there was a bad smell somewhere in the cemetery and pointed to where he thought it was coming from. It was rotting flesh and it was coming from a cracked tombstone. It had attracted the attention of greenbottle flies. They have a habit of laying their eggs in cadaver tissue within hours of death. When the tombstone was removed they found a decomposing body. Of course it was poor James Morris. An autopsy revealed he had been severely beaten and then stabbed. 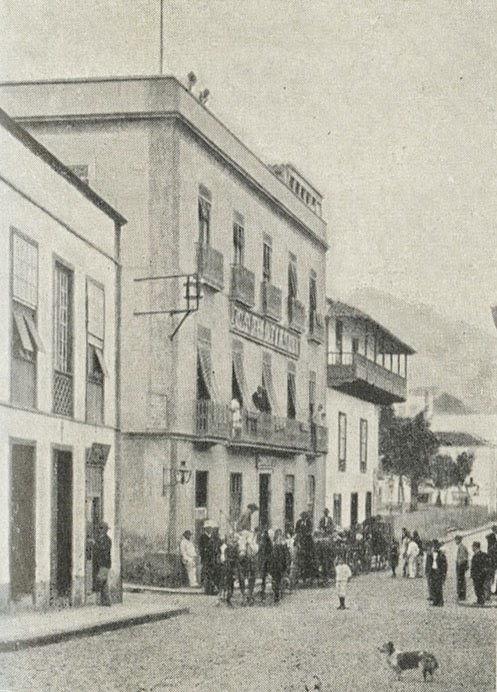 The trial of Brito and Armas is classified as a "celebrated legal case"
Investigators discovered that Brito and Armas had befriended el inglés in a local tavern and they were arrested and taken, first to the jail in La Orotava and then to the prison in Santa Cruz where they admitted the crime. Three years later they met their own death, horribly garrotted, close to the very spot where they had murdered the accountant, James Morris. Jessica Duncan Smyth is not the first woman known to have climbed Mount Teide. 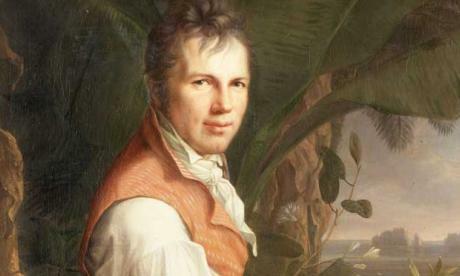 According to Canary Island historians she may have been preceded by a Scottish lady whom they simply refer to as Mrs. Hammond, believed to have crossed paths on the volcano with another expedition organised by the Prussian geologist Leopold von Buch in 1825. But Jessie, as everyone knew her, did belong to that unique and distinguished category of 19th century British women who made their name travelling the world in search of knowledge, adventure and, on occasions, romance. 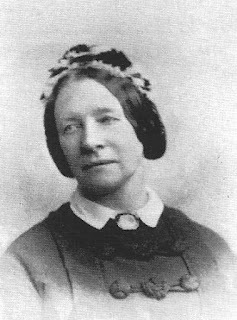 Jessie came to Tenerife in 1856 to accompany her famous astrologist husband, Charles Piazzi Smyth. 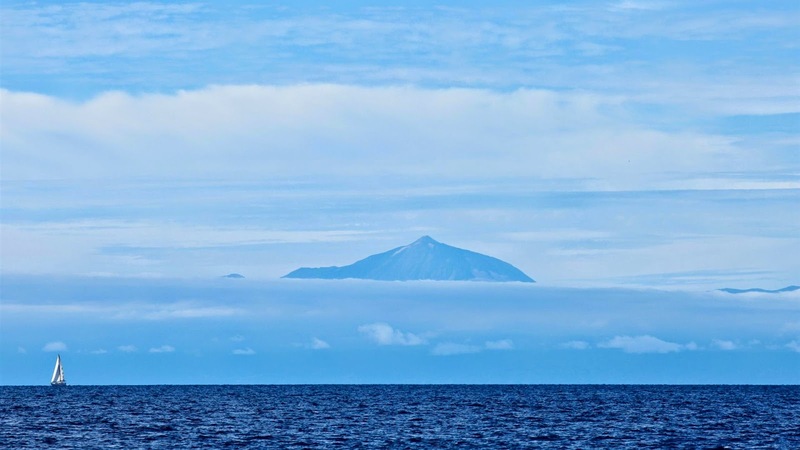 The purpose of the expedition was to assess the potential of the island’s high mountains for an astronomical observatory. But as well as scientific, it was also a romantic adventure because they were just married. 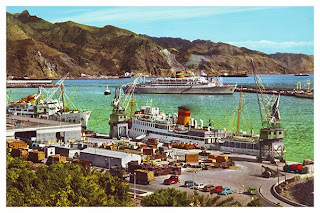 Their honeymoon, in fact, became a voyage to the island on the yacht Titania, as well as a prolonged stay on the island of Tenerife, sixty five days of it spent on Mount Teide. Jessie was one of the first women to have been a member of a scientific expedition of such importance and her role marked a turning point in the history of the islands during the 19th century. 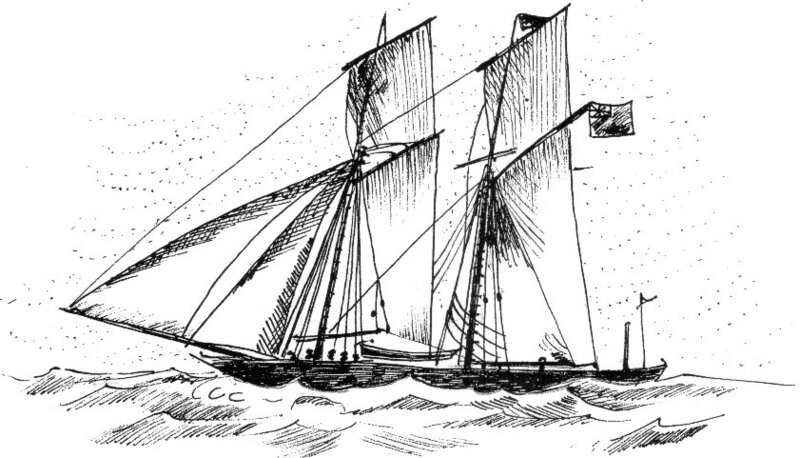 The Titania was a magnificent schooner. She was launched in 1853 and was the second of the same name to belong to Robert Stevenson, the great 19th century engineer. He put the yacht at the disposal of his fellow scientist for the entire duration of the expedition to Tenerife. Stevenson, of course, was a man of immense wealth but he was extremely generous with it. Sadly he suffered ill health for many years and died while sailing on his beloved Titania in Norwegian waters just three years after lending it to his astronomer friend. 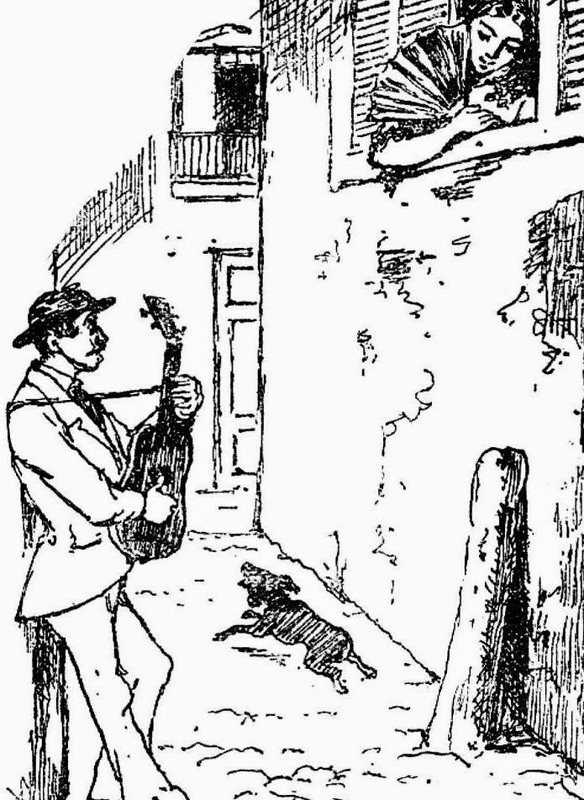 The Titania, illustrated by Annie Chapman in "New Year on Piazzi's Mountain"
In Tenerife Jessie met Mr. Alfred Diston, a British merchant in the Orotava Valley who always saw to it that British visitors were well received. Through him she also became friends with Elizabeth Murray, the artist and writer who had been in Tenerife for six years due to her husband’s consular position. 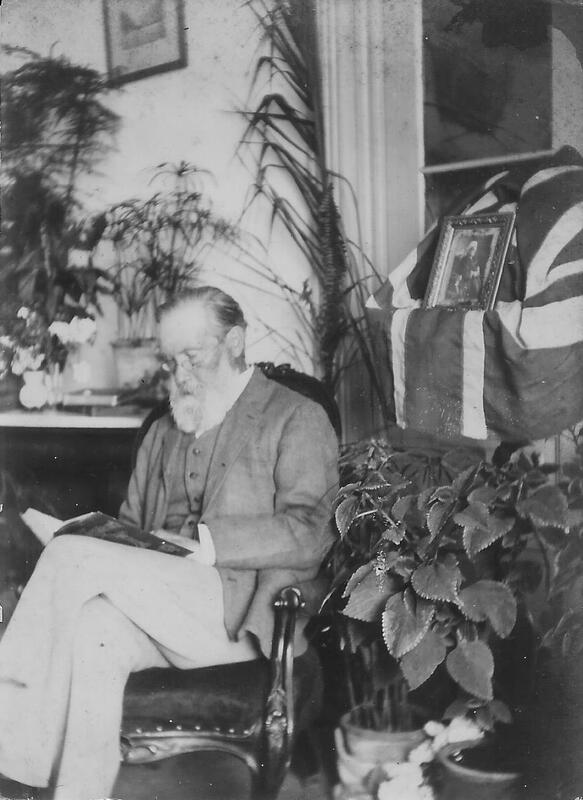 But Jessie, whose father, lawyer Thomas Duncan had also been an artist, was not going to accept the comforts and company provided by the small and distinguished British community. She had studied geology in Edinburgh and her love of adventure and scientific travel was equal to Piazzi's. Jessie became a very important member of her husband’s scientific expeditions. 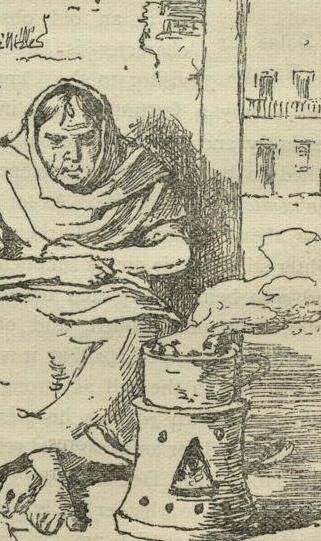 She always kept notes and made sketches for their adventures and learned to prepare and to preserve local foods. 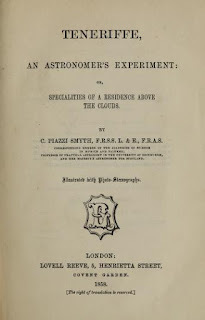 Amongst other activities she acted as photographer for the astronomer’s team. Indeed her stereoscopic prints were the first to have been published alongside text in a book and her work is considered of pioneering value. 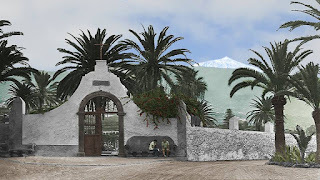 On Mount Teide a walled enclosure provided shelter for the Piazzi's telescopes, as well as for the honeymoon couple and companions. 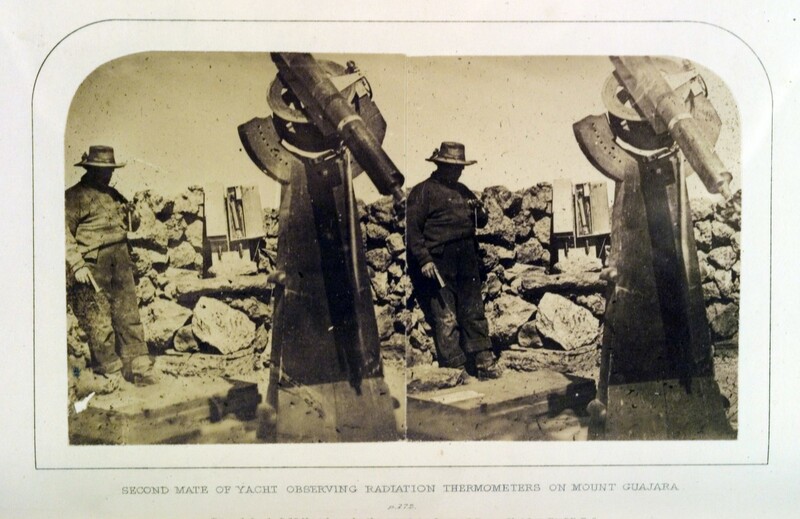 This is what George Graham Toler later developed into the Alta Vista mountain refuge. 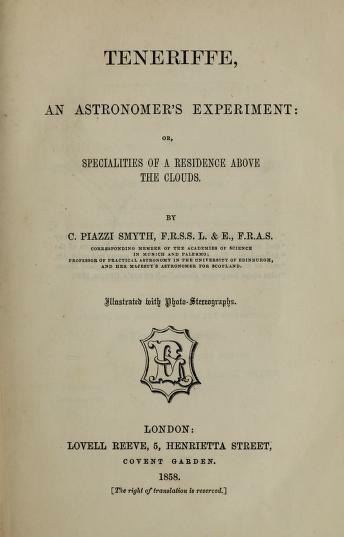 It was thanks largely to the novelty of including twenty of Jessie’s stereoscopic reproductions in Charles Piazzi Smyth’s book, Teneriffe: an Astronomer’s Experiment or Specialities of a Residence above the Clouds, that it was accepted for publication in 1858. 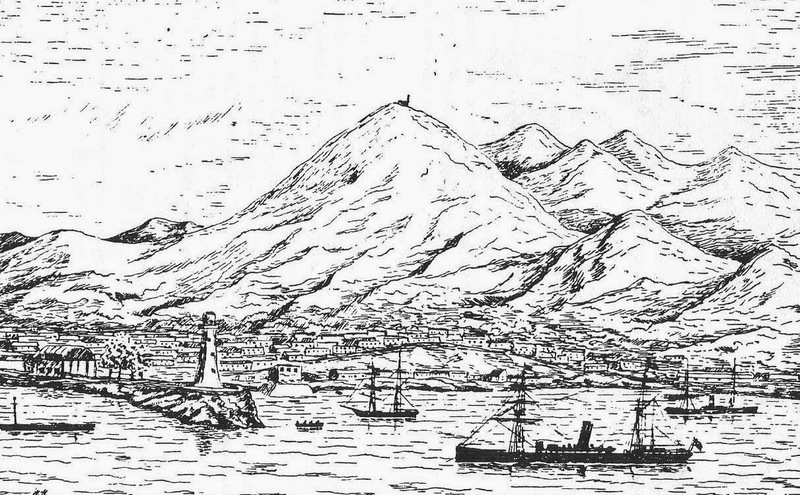 Piazzi's account of his experiments in Tenerife. After Tenerife the husband and wife team travelled to Russia and in 1864 the couple spent a year in Egypt. Jessie and Charles Piazzi Smyth lived four months under canvas whilst carrying out investigations into the Great Pyramid of Giza. Jessica’s photographs, inside and outside of the pyramid, were essential for backing up her husband’s work. 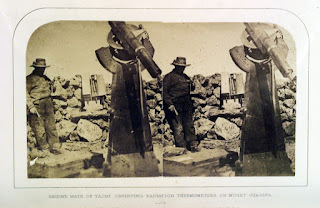 Actually her photography in Tenerife only found limited recognition in the British Isles, but Canary Island historians consider Jessie Duncan Smyth’s work most important. After all, she was the first to have photographs of their islands printed in books. Therefore she is one of those early travellers who helped put Tenerife on the map, especially in scientific circles, and to have turned the spectacular mountains of Tenerife into a prime destination for any explorer. 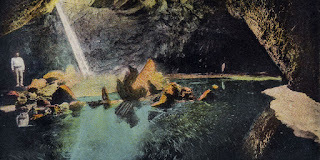 Some of her photographs of the interior of Teide’s ice cave captured the imagination of many explorers and early visitors to the island. The domed cave hid a beautiful icy lagoon with the purest water to be found, and icicles and stalactites hung in it like fragile works of art. A photograph taken in 1927 inside the ice cave. 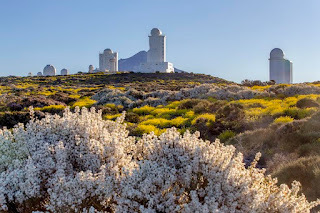 The islands today are considered one of the world’s best locations for astronomic observations and there is no doubt that the Canary Islands Astrophysics Institute, with its Tenerife centre at Izaña, owes much to Charles and Jessica Piazzi Smyth’s expedition in 1856. 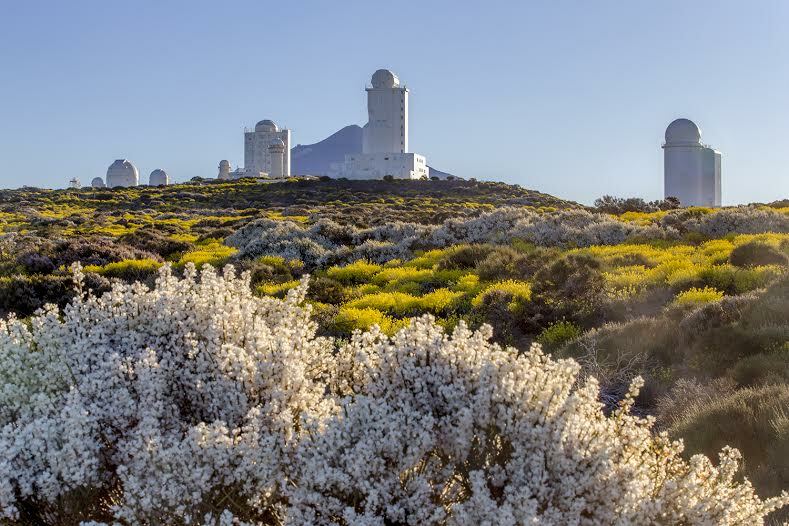 The Mount Teide Astrophysics Institute at Izaña. The couple retired to North Yorkshire where Jessie Piazzi Smyth died in 1896, aged 81. 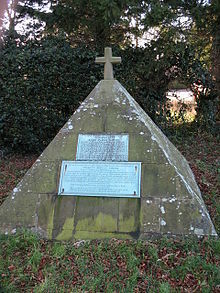 There is an interesting, pyramid-shaped monument to the couple in the churchyard at St. John's Church at Sharow. It is a pleasant thought that they took their romantic adventures in Tenerife and Egypt with them to the grave. The unusual pyramid where the scientific and romantic adventurers, Charles and Jessie, lie at rest. Looking back on things, or remembering epic or even minute historical events and the reasons they came about is never a waste of time. Indeed past moments are always worth reflecting upon as they can often explain the present. 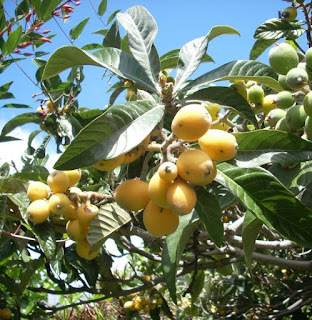 To the Canary Islander, whose known history dates just over six hundred years, any event, however small in a world context, is naturally framed as vitally important. Rightly proud they should be indeed, for these islands have played a huge part, due to their stategic geographical situation, in world affairs, not least in the discovery and conquest of America. But this incidental account touches casually on one of those minute historical events which, because of the characters they involved, attracted my attention. It is a very personal description of Sir Winston Churchill's brief visit to the island of Tenerife in 1959 and I can't help thinking that the old man must have amused himself, and perhaps his companion Mr Onassis, remembering that only 18 years earlier, in September 1941, he had contemplated invading the Canary Islands. This possible invasion plan, codenamed Operation Pilgrim and which was drawn up with the Americans, might have taken place had General Franco done a deal with Mr Hitler and accepted Germany's assistance to take Gibraltar. 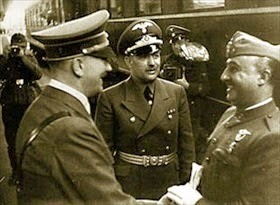 Luckily, it was a suspicious Franco who met Hitler at Hendaye in the Pyrenees, and his considerable demands and his reluctance to enter the war on the Axis side, led to seven hours of fruitless negotiations. In 1956 Randolph Churchill introduced his father to Aristotle Onassis, the Greek tycoon. Churchill, who was relaxing on the Côte d’Azure at the time, described his encounter with Onassis to his wife Clementine in a letter. I like him. He is very pleasant and domineering and told us a lot about whales. He kissed my hand! Onassis so impressed the old statesman that he told his secretary he would like to meet the Greek again. That is how their relationship, which many people frowned upon, developed. Churchill gave Onassis important international prestige although it is believed Onassis never actually used the Englishman’s contacts for business interests. 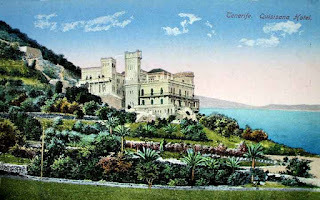 In return, Onassis offered Sir Winston a great deal of Mediterranean luxury and comfort. Churchill is known to have said, I have simple tastes. I am satisfied with the best. Actually the two men had a number of interest in common. One was oil. Churchill, when he was First Lord of the Admiralty, had pushed to have every Royal Navy ship running on oil rather than coal. 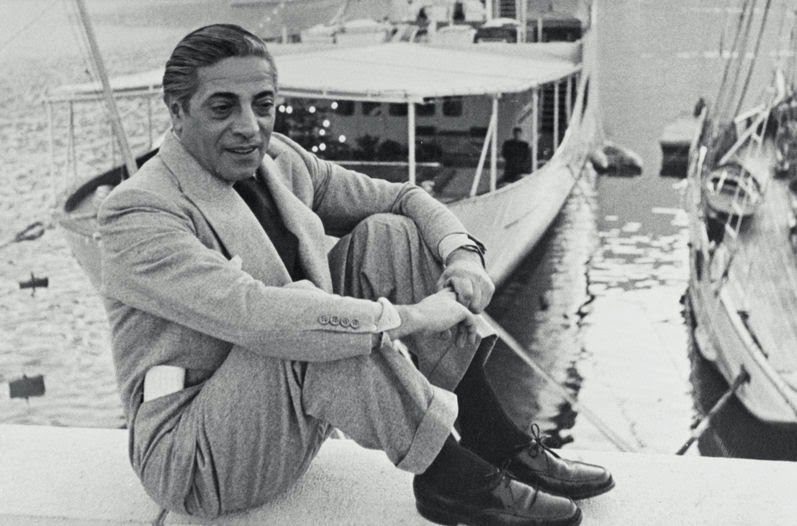 Onassis owed most of his enormous fortune to the maritime transport of oil. 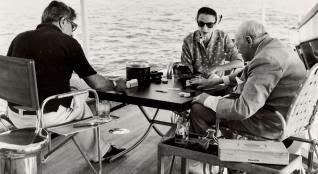 As a result of their friendship Onassis invited Churchill to accompany him on his yacht, the Christina, on eight cruises in the Mediterranean and the Atlantic between 1958 and 1963. Celia, Sir Winston’s granddaughter, observed that he had aged considerably and was wonderfully happy on the yacht and those pleasurable holidays appeared to give him renewed life. Onassis, apart from being one of Churchill's great admirers, was an intelligent and civilized man who did all he could to make life as enjoyable and easy as he could for the old, valiant leader. Churchill’s doctor, Lord Moran, described how Aristotle Onassis never stopped caring for his friend. In one moment he would be giving Churchill a whisky. In another, when Churchill felt chilly on deck, Onassis would cover him with a blanket. In 1959, when the Christina made her first voyage to the Canary Islands, Churchill was 84. He was still a member of the House of Commons and in good health. Sir Winston had been spending a few week’s holiday at the Mamounia Hotel in Marrakech with his wife Clementine and daughter Diana. Morocco was one of his favourite places to which to escape and sketch. 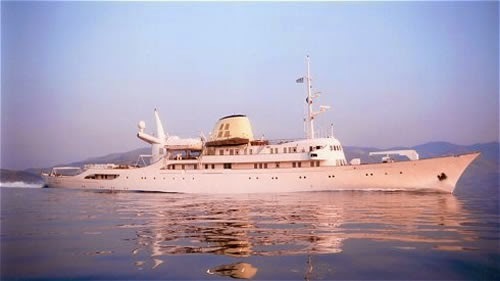 The Christina was at Casablanca and on the 17th February Aristotle and his wife Athina, daughter of shipping tycoon, Stavros G. Livanos, got into the ship’s seaplane and flew to Marrakech where Churchill was giving a farewell dinner. 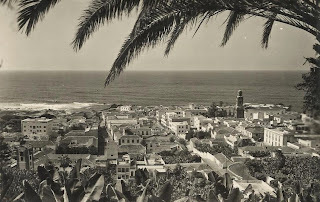 On the following day Churchill and his party made their way to Safi, on the Atlantic coast, where Onassis took them aboard for a cruise to the Canary Islands. This was not part of an invasion plan but a peaceful visit and they were joined by Sir Anthony Montague Brown, from the Foreign Office, Sergeant Edmund Murray of Scotland Yard, and Arthur Sheppard, Churchill’s personal nurse. Three days later, on a glorious morning and with a crowd gathering to catch a glimpse of Churchill, the Christina docked in Santa Cruz. Churchill spent the morning aboard and lunched early with Mr Bill Lucas, Director of Miller and Co., shipping agents in Tenerife and Las Palmas. His wife Clementine, Athina and Mary Lucas went exploring. It was not the first time Lucas and Churchill had been together aboard a ship. During WW2 William Lucas was an MI6 agent in the Carribean. In 1944 both he and Churchill returned to Britain from New York aboard the Queen Mary, which was transporting support troops destined for the already launched Normandy invasions. Winston Churchill had been to the Quebec Conference and to his meeting with Roosevelt. Clementine and Athina were so enthusiastic about the beauty of the Orotava Valley and the charms of Puerto de la Cruz that Churchill and Onassis decided to have an excursion themselves. 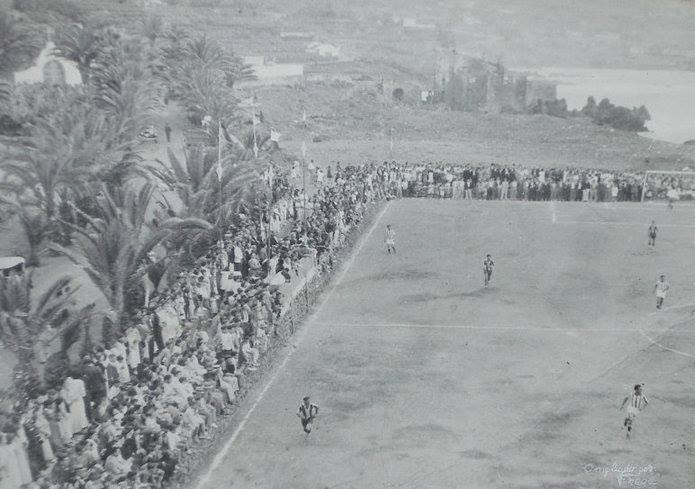 In fact Churchill's visit to Tenerife really began after his lunch with Lucas and simply involved a drive to Puerto and back along the winding roads of the 1950s. Onassis had a convertible version of the Fiat 500 with wicker seats on his yacht and it was lowered onto the harbour in Santa Cruz. It was a tiny car, with tiny wheels, low on the ground and had a rear engine which sounded rather like a lawn mower. To everyone's surprise Sir Winston Churchill was eased into the little car and Aristotle, the powerful millionaire, drove them off out the harbour at a dizzy speed in the direction of Puerto de la Cruz. 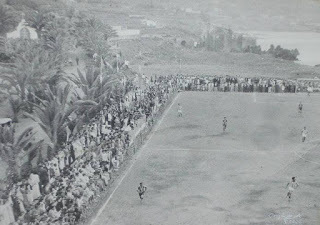 They made various stops on the way but from the Taoro Hotel, close to All Saints Anglican Church, the two men were able to admire the beauty of the Orotava Valley, undeveloped as it was then with acres of banana plantations. 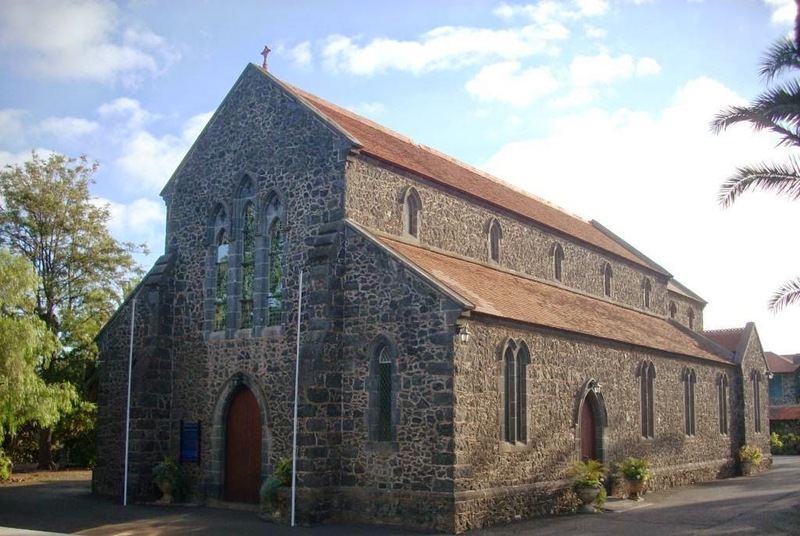 I wonder if Churchill was aware that when his plans to invade the Canaries during the war were drawn up, Thomas Reid, the British Vice-Consul in Puerto de la Cruz was issued with a giant Union Jack and was given orders to drape it over the roof of All Saints Church, where British and other allied residents would be safely gathered in the event of an airborn raid. Sadly it is thought the flag, along with documents of immense historical value, were destroyed when the British Vice-Consulate in Puerto closed down in the early 1970s. Rio Reid, who inherited the position of Honorary Vice-Consul in Puerto de la Cruz from his father Thomas, was unwell that day in 1959. So the Mayor, Isidoro Luz Carpenter, sent a message to his brother Noel Reid, who was in the middle of his usual game of bowls at the British Games Club, to inform him that Mr Churchill had decided to pay a visit to Puerto. 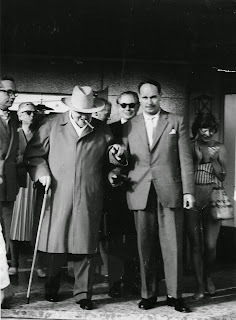 Noel Reid collected Isidoro Luz and took him to meet the great statesman and Churchill was received by the Mayor at the Lido San Telmo, together with an enthusiastic and applauding crowd of British residents, tourists and local people, all of whom were squeezing each other to get as close as possible to Mr Churchill. This was indeed a minute historical event of enormous importance to this Atlantic community. In his diary Noel Reid recalled, Churchill was smiling all around and making the V sign. It was very pleasing. Isidoro Luz was as thrilled as I was. They didn't take little Fiat 500 back to the Christina. Churchill had rightly complained that he had found the drive over, especially through La Laguna in a convertible car, frightfully cold! 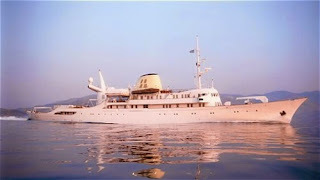 Instead he and Onassis were chaufeured back in a large, black saloon in time for an early dinner aboard the Christina. It might well have been the magnificent, black American Pontiac which belonged to the Mayor of Puerto de la Cruz. 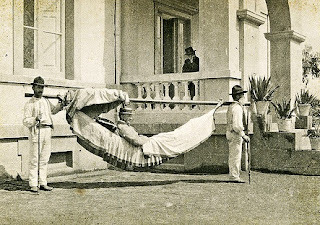 However brief, this was an intense and memorable visit which Sir Winston Churchill made to Puerto de la Cruz and to Tenerife and before the Onassis yacht departed for Las Palmas in the early hours of the morning, the Churchills were presented with orchids, Canary drawn linen work, a box of fat cigars, oranges, and two dozen bottles of local Malmsey wine. Author of The Skipping Verger and Other Tales, a collection of short stories. When he arrived on the island of Tenerife in 1826, The Blind Traveller was forty four years old and already one of Britain’s most widely travelled personalities. But he was no ordinary voyager for James Holman, the fourth son of an English chemist from Exeter, was completely blind. He also suffered from debilitating pain and limited mobility. Nevertheless he was an adventurer in mind and spirit and like so many of his contemporaries with that typical stiff upper lip education, he forbade anything from weakening his resolve. 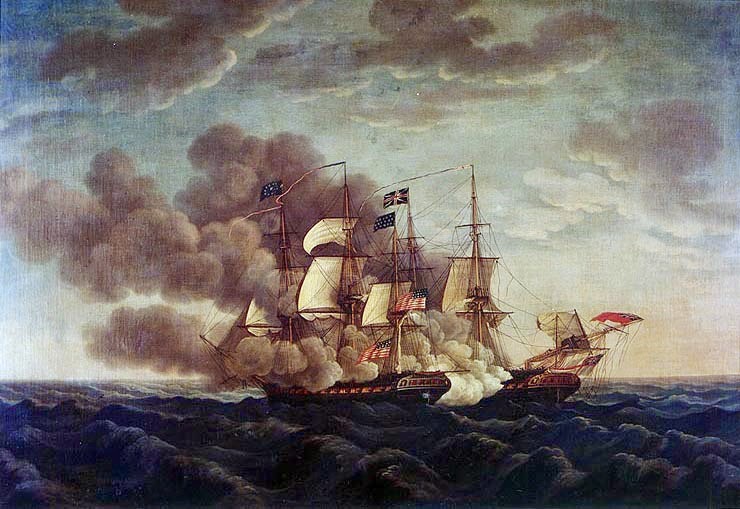 James Holman had entered the Royal Navy in 1798 just a year after Horatio Nelson suffered his only defeat at the hands of the Spanish garrison in Santa Cruz de Tenerife, and was appointed lieutenant in 1807. 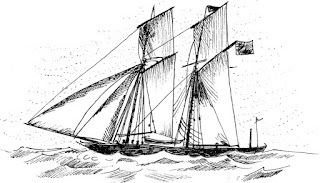 But in 1810, whilst off the Americas on HMS Guerriere, a ship captured from the French, he was struck down by a strange disease which at first affected his joints and quite soon afterwards his sight. He became totally blind at the age of 25. Having become ill during the course of his duty James Holman was appointed to the Naval Knights of Windsor and therefore provided with a lifetime grant of care in Windsor Castle. In exchange for this help which was available to British military personnel his only obligation was to go to church twice a day. Such inactivity made him restless and depressed and he asked for leave on the grounds of ill health, first to study medicine and literature at Edinburgh University and then to travel through Europe for two years in 1819. This was to become the first of The Blind Traveller’s incredible solo excursions abroad, during which he used a method of human echolocation, the ability to detect objects and shapes in their environment by sensing echoes from them, to describe what he perceived. Possibly an interesting example of fate if one considers he had volunteered for the Royal Navy in order to see the world. He had to be a man of notable energy and perseverance and was curious about absolutely everything. To begin with he travelled mostly alone, daring to go a bit further every time, and depended to a large extent upon his own astuteness as well as the kindness of ordinary folk. His journeys took him from France to Syria and Turkey and from Italy and Switzerland through to Russia and Siberia, where he was actually arrested on suspicion of being a spy! He even travelled in Africa and as far as Australia. 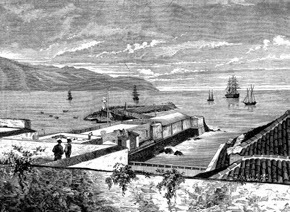 When his ship anchored in the bay off Santa Cruz James Holman expected to be met by Mr Gilbert Bruce, the British Consul General. However Mr Bruce was away in England and so it was the new Consul, Mr Francis Coleman Macgregor, who went to the port to welcome him. In fact this worked out rather well. 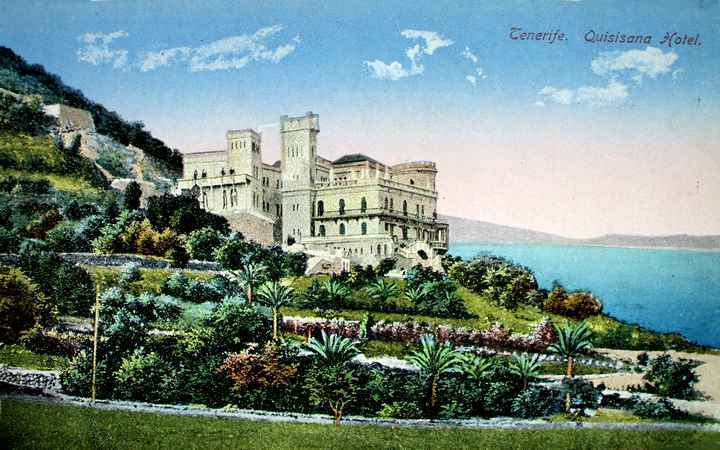 Not only had they met before but Mr. Macgregor who had recently been appointed Consul to the Canary Islands, was just as eager to learn about Tenerife and its inhabitants. Although Holman journeyed mainly on his own, he would never turn down the companionship of a fellow traveller. What he could not feel or sense, his companion would describe. The population in Santa Cruz was only about 6,000 people in 1826 and he wrote about the streets being rather empty and lifeless. In the heat of mid-day that would not have been unusual. The road to La Laguna he found in a deplorable state, rocky, dusty and dirty. It was in La Orotava that he really encountered the colourful charm of the tinerfeño, feeling a vibrant commercial buzz mingled with the people’s open and warm nature. Like so many visitors, James Holman was evidently touched by the islander's uninhibited generosity and how curious that even a blind man could appreciate the Canary Island women as being extremely beautiful, with black eyes that made them even more attractive. In recent years one of the principal complaints made by older visitors and local people alike has been that the island of Tenerife has been overcome by reckless construction and an overpopulation of about one million inhabitants. So it is interesting to know that even as long ago as the early 19th century a blind man sensed there were too many people on the island and remarked upon the need for islanders to emigrate. His observation was made when the population in Tenerife was only 80,000. 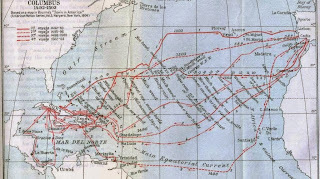 He also remarked at how remote the islanders were despite being so close to the continent. 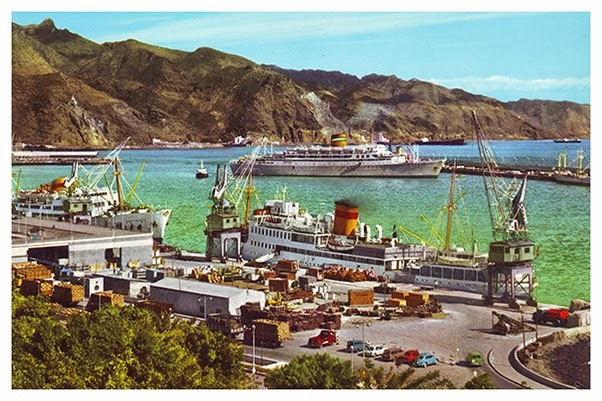 One can´t imagine what James Holman, who came to Tenerife when travel was certainly more adventurous but possibly gentler, would feel if he visited the island today with its busy airports ferrying in five million tourists every year! Holman noted that most islanders in 1826 lived from agriculture and fishing and referred to a land of palms, fig trees, vineyards, sugar cane, lemons and oranges. He must have felt a considerable echo from the majestic examples of Canary Pine, the pinus canariensis, because he wrote most enthusiastically about it. He also found the wines quite exquisite. Some of his observations might seem a touch eccentric, but one has to understand that any minute detail can be of enormous significance to a blind person. Holman mentioned the fact that there were a lot of camels used for transport and that everyone seemed to smoke, complaining nevertheless that it was difficult to find any cigars! He remarked upon ice-sellers, men who made a living offering ice which they brought down from Mount Teide, sometimes offering it to travellers stirred in refreshing, squeezed lemon juice. His reference to traditional fiestas is particularly revealing. In his book Travels in Madeira, Sierra Leone, Teneriffe, St. Jago, Cape Coast, Fernando Po, and Prince´s Island, he pays special tribute to the custom of the Piñata, possibly because it alluded to the instinct and perception of blinded people. 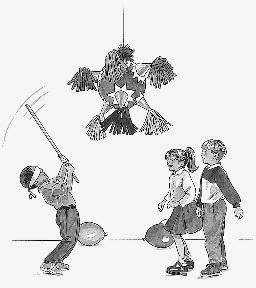 Today it is a favourite at birthday parties when blindfolded children take turns to beat a decorated bag, the piñata, which hangs full of surprises and gifts from a tree. What James Holman described were blindfolded young men doing much the same to a bag containing gifts. The men would then race to gather the contents which spilled out of the broken bag and offer the gift they were able to retrieve to their chosen lady or novia. How he must have wished to have beaten a piñata and received the gift in the form of a miracle. An interesting subject for the student of psychology…….a blind man observing blindfolded men at play. 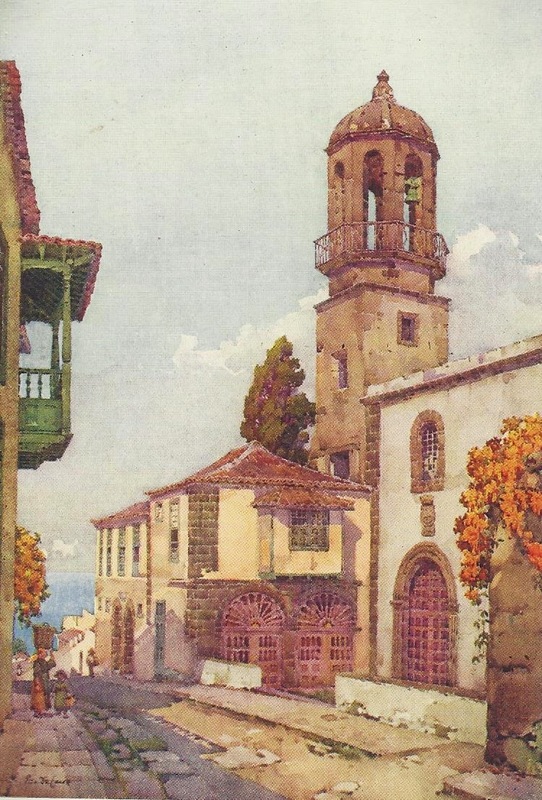 Like many other travel authors of his time Harold Lee placed the Portuguese Madeira archipelago and the Canary Islands into one area of study. 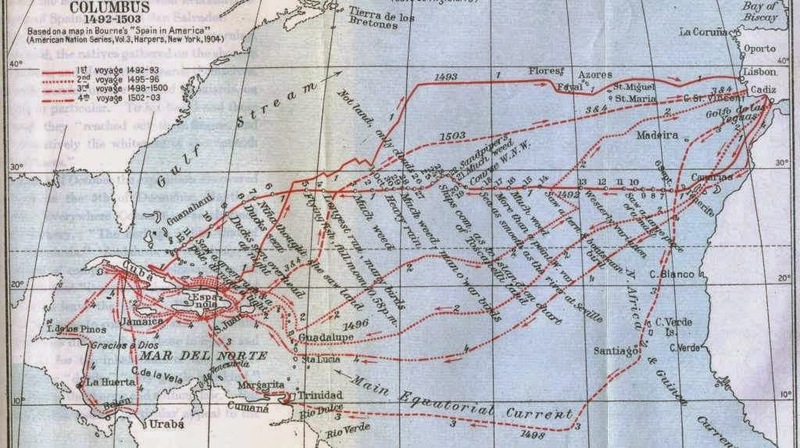 Both groups of Atlantic islands form part of Macaronesia, the Islands of the Fortunate or μακάρων νῆσοι makárōn nêsoi, as ancient Greek geographers referred to them. But there was another, more practical explanation for this. Steamers from the British Isles carrying passengers to the colonies often called in on both. 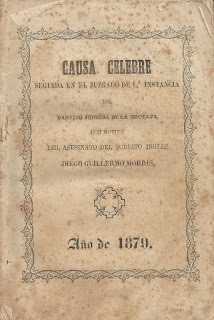 His book, Madeira and the Canary Islands, a Handbook for Tourists which was published in Liverpool in 1888, is a constant comparison between the two and he portrays them, especially the island of Tenerife, with charm and candour. You must not look at the horizon itself, but in the sky above. Then, as you gaze, you will suddenly behold it, not looking like land at all, but to all appearance a nebulous cone, faint sepia in tint, floating above a deep bank of haze or cloud. Most visitors in the late 19th century aimed to stay in the Orotava valley which indeed charmed him and where oleander, euphorbia, poinsettia and hybiscus flaunt their radiant colours before every passer-by and where orange trees were borne down to the earth by the sheer weight of their golden fruit. But Lee preferred the gentle rhythm of life in the capital, Santa Cruz, possibly because he liked to study people and their ways of life, especially those which so differed from his own. He paid tribute to Camacho's, Clarke's and The International hotels. These, as one can imagine, were splendid and delightful examples of a different age. Camacho himself is a Portuguese who speaks English and understands English ways. How very, very superior indeed! The Camacho was advertised as an English Hotel, the oldest, best and most centrally situated, having forty large well-ventilated bedrooms, with sitting room, billiards and smoking rooms. Furthermore, there was even a bathroom on each floor and sanitary arrangements were examined by a Doctor Paget Thurstan.....an English resident! Harold Lee was a keen observer of local custom. He referred to the eating of gofio with almost every meal. It was the staple diet of the original Guanche inhabitants, based on ground and toasted grain, typically wheat and varieties of maize and very similar to that used by Berber tribes of North Africa. He noted a preference for salt fish too and sketched a peasant woman selling roasted chestnuts on a street corner in the autumn. On occasions he sounded somewhat cynical in his honesty, as he would do, for instance when suggesting the visitor to the Canary Islands must not expect to find energy a feature of their inhabitants. He did qualify this by reporting that the peasantry, whom he described as exceedingly poor but content, did labour very hard to make the land produce. Lee remarked at the amount of children who smoked, and at the easy life the law keepers had, with hardly a disturbance ever occurring. Indeed, he suggested that any misbehaviour upsetting the tranquillity of this paradise was most likely to come from foreigners. A resident Englishman once admitted that in three years the only drunk he had seen was “precisely an Englishman”. 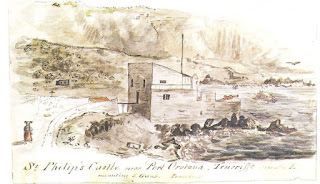 Nevertheless, although he assured brutality is here unheard of or very rare, Lee was told about the clerk of a wealthy merchant having been murdered for money in Port Orotava. 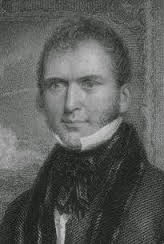 He was of course referring to a cause célèbre, to the death in 1878 of Mr James Morris, a gentleman who looked after the accounts of a firm belonging to Mr Peter Spence Reid, a well-known Scottish merchant. Like one or two other comfortably off English travellers of his time, Harold Lee did show signs of irritability on occasions. One has visions of him being molested by marauding flies, especially after reading that his dislike for the habit of begging was so profound as to suggest that the practice might actually have been authorised, usually on Saturdays. On a gentler, more charming note perhaps, referring to courting couples he wrote that they were not permitted to whisper in each other´s ear at a dance. In fact wishful lovers were only permitted to court after the man had proven his creditable conduct and when his economic value had been approved by the girl´s family. Of course she would never be alone with her novio, always being escorted by her mother, aunt or sister. Will his music pave the way to her heart? But like so many visitors to the Canary Islands, Mr Lee felt quite blessed by this Atlantic paradise. There is a hint from time to time that he might even have wished he weren't so inhibited by his superiority. He admits, in a fleeting reference to Canary Island women, their flashing eyes and expressive features are quite in keeping with Spanish loveliness.